It was almost 30 years ago to the day that I attended my first exhibition of post-impressionist art. That was in London: it was Post-Impressionism at the Royal Academy of Arts, 1979-80, and we went on March 9, 1980, the last day of my first European trip. Last night, March 4, 2010, we went to the Masterpieces from Paris exhibition at the National Gallery of Australia. 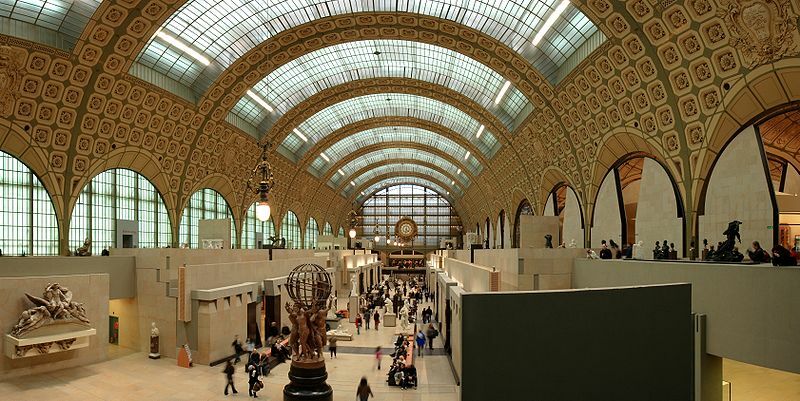 It is an exhibition of post-impressionist art sourced solely from the wonderful Musée d’Orsay. The Royal Academy of Arts exhibition, by contrast, contained paintings sourced from collections besides their own. Now, being a librarian-archivist, bibliophile and all-round hoarder, I still have my catalogue from the 1980 exhibition, and so I did a little comparison. I loved that first exhibition – partly because the post-impressionist era is a favourite of mine – but when I compare the offerings from the two exhibitions, well, there’s a big difference. The Musée d’Orsay’s collection is outstanding and to see such paintings as Van Gogh’s “Starry night” and “Bedroom at Arles”, and Monet’s “Waterlily pond, green harmony” in my home town on the other side of the world is something to be treasured. However, the The Musée d’Orsay exhibition is not only great because of these top masterpieces; it is full of treasures, big and small. Some of the small treasures that caught my attention included works by Maurice Denis. Now, I checked him out, too, in the two catalogues and found an interesting example of art on the move. In the 1980 exhibition was Denis’ lovely, colourful “Sunlight on the Terrace” (1890). The catalogue, as catalogues do, said it was “Lent by a private collector, St Germain-en-Laye”. Clearly that collector did not hang on to this gorgeous piece (and wouldn’t it be interesting to know the story behind that) because here it now is in the Musée d’Orsay’s collection. This current exhibition catalogue says it was “purchased, 1986”. I liked this little work, as well as a few others by Denis. As, I think, most of us like to do when we go to an art exhibition, I looked for a work or two that particularly appealed to me. Of course, it’s hard to go past the “biggies” like the Van Goghs, Cezannes, Monets, and the like. We’d seen some before, but they were then, and will remain always, stupendous. However, the fun is finding new artists or new works to take your fancy. For me, this time, these new works included a couple by Denis. They also included an artist I don’t recollect having heard of before, Théo van Rysselberghe. He worked quite a bit, though not solely, in the pointilist style, and two of his works are in the exhibition. The one that particularly appealed to me was “The man at the tiller” (1892). While the waves seemed a little clumsy to me, I was drawn to its simple but dramatic composition. I also like its allusion to Hokusai’s famous “The great wave of Kanagawa” (1829-1832) – and I like it because I am fascinated by pointilist painting. The exhibition – of 112 works by 35 artists – is beautifully curated. The works, which cover the significant styles and schools – including Pointilism, Neo-impressionism, Synthetism, Symbolism, the Pont-Aven School, and the Nabis – that loosely comprise the Post-Impressionists, are spread thematically across 6 rooms. This arrangement works well to demonstrate development within these styles as well as between them – and it resulted in several artists appearing in different rooms as they developed their style over the period. And, the lighting is magnificent. “Starry night”, for one, simply shimmers. It’s no wonder that the Gallery reached its target of 250,000 visits 6 weeks before closing. This is a blockbuster to end all blockbusters. Wow! What a fantasic exhibition! I would love to see Van Gogh’s Starry Night in person, it is one of my favorite works of art. But you are right, finding the lesser knowns that are gems is great fun too. Without trying to make you too jealous, Stefanie, it was even better than you could imagine. Absolutely glorious. BTW This exhibition is going to three places only while the Musee d’Orsay is being refurbished – it’s a real coup to get it – and they are Canberra, Tokyo and San Francisco. So there, can you find an excuse to get to SF? Silly me – of course, your banner is from Starry night. I always like going to your blog and seeing that image. I wish I could find an excuse to go to SF but alas, no. maybe one day I will make it to Paris and see it there. I have seen one of the Iris paintings in person and the sunflowers. Came upon them both unawares and was absolutely floored. So was my husband. The other museum goers must have thought us loopy because we just stood there looking and crying because we were so overwhelmed. You have *got* to be kidding me. Are you honestly saying that I’m going to be in France in a few weeks’ time and will miss out on these beautiful pieces of artwork BECAUSE THEY’RE IN MY HOMETOWN IN AUSTRALIA RIGHT NOW?!?!?! I visited the Musée d’Orsay on a trip to Paris in 1999. It was the most astonishing place; everywhere you turned there was a recognisable painting or, at least, a recognisable name. I absolutely adored the whole thing. Sadly, what I didn’t adore, was all the idiots standing in front of the paintings to have their photograph taken next to it. I mean, what is the point? Surely you’re there to see and appreciate the work of art, not to become a work of art yourself? No, I don’t believe we did – I’ve only been to London twice and the second trip was very short (the London bit – I tend to be a bit of a get-out-of-the-city-quick traveller. For example when we travelled in the northwest of North America we bypassed Portland, Seattle and Vancouver!). Anyhow, I have been to the Tate, the British Museum, the Royal Academy of Arts and the National Gallery. I am keen to get to Courtauld though. Isn’t that the place that Anita Brookner has some association with? Of course Paris would be the ticket Stefanie. Hope you can get there one day. I totally understand what you mean by the Sunflowers and Irises. There was a Sunflower painting in this exhibition too, and I have seen them before. His painting – particularly of natural subjects like these flowers, night etc – is absolutely luminous isn’t it? In Nov 1910, Roger Fry organised the first ever exhibition of Post-Impressionist art in Britain, called Manet and the Post-Impressionists. It was held in the Grafton Galleries in London and went down like a bomb with the critics but well with the art loving public. I know which artists were included, but it is difficult to find which _paintings_ were included in the 1910 show. Then I came across your post on the exhibition of Post-Impressionism at the Royal Academy of Arts 1979-80, also in London. Perhaps you can tell from your catalogue if the 1979 programme attempted to replicate the 1910 collection.. at all. Hi Hels, nice to hear from you. The catalogue does refer to Fry’s exhibition but they have defined the period more loosely. They do list the artists in that exhibition and how many works for each but not what the works are (with a couple of exceptions, such as Manet’s A bar at the Folies-Bergiere). The introduction cites the exhibition catalogue which presumably lists the works? Or have you tracked that down and it doesn’t list them all? I’ve look up worldcat.org and found that several copies of this catalogue exist around the world but no listing for Australia, which doesn’t mean that there’s not one here. Could just be that they haven’t contributed to worldcat.